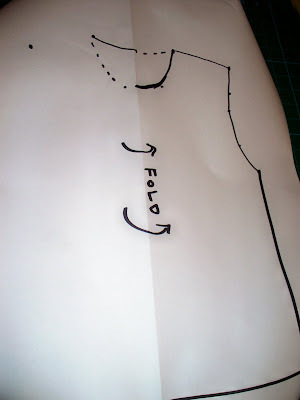 and a lap tee, such as this, This tutorial is about how to create the pattern, and not how to sew the pattern together. 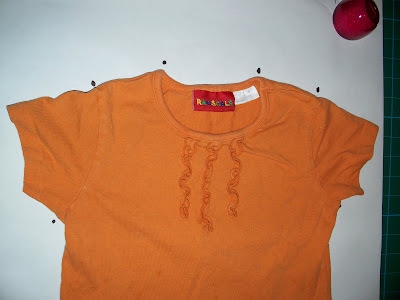 I am assuming a basic familarity with sewing this type of pattern, although I can in the future, if anyone wants, go over the basic points on how to sew a tee shirt. Oh, and another quick disclaimer: this way of creating a pattern will work well for children, but not so great for adult clothing. The reason is is that most small kids are basically straight up and down and you can make the front and back the same dimesions. 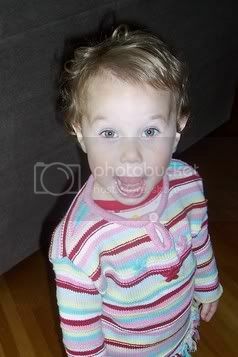 With adults (and some kids) we've got all sorts of bumps and curves that interfere with a garment hanging down nicely. Most patterns compensate for and enhance our curves with darts, extra ease, etc. 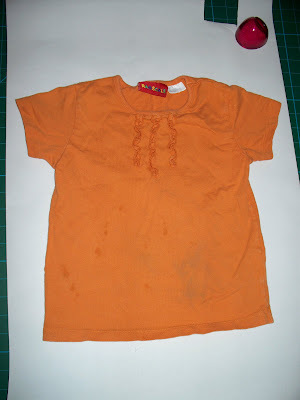 But for us who just need to build our small ones some comfortable tees (and we need to be able to make it during nap time), this pattern works quite well to make quick, easy, comfortable and attractive tees. Lay the tee out as flat as you can (keeping in mind that it will not lay perfectly flat or straight ever, especially if its been worn alot). Don't worry about the sleeve right now, we'll do that part later. To make two pattern pieces, a front and a back, mark with a dot the mid-point of the back of the neck hem, and another mark for the front of the neck hem (you'll have to lift the shirt, keeping your finger on the mark, and get your pen in there as best as you can). 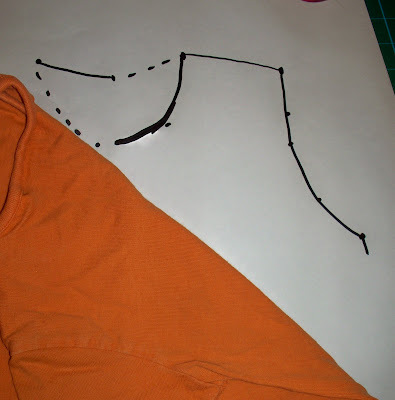 Sketch in the shape of the neck hem, one of the shoulders, and one arm hole (hold the seam and lift the sleeve away from the paper to mark approximately the shape - same as with neckline). Also trace the line of one side and half the bottom of the shirt. 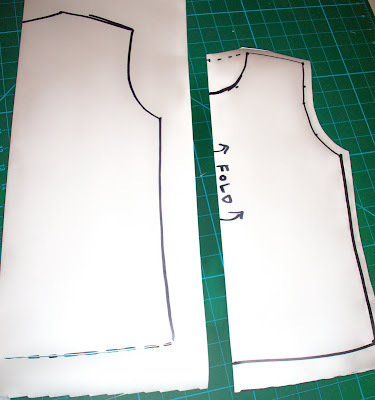 The reason why only half the shirt is drawn in is that you are going to fold the paper over along the vertical center of the shirt and then cut out along the lines you have drawn plus seam allowances. The seam allowances go all around the outside of the bodice (not the folded edge) with a little bit extra at the bottom to make a hem with. 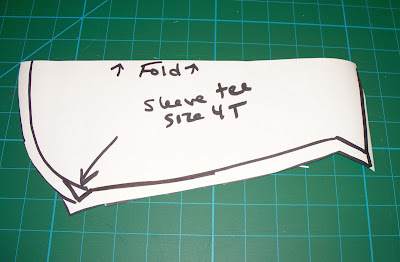 Fold the paper in half and cut either a 3/8" or 5/8" away from your lines (which ever seam allowance you feel most comfortable with). You may want to measure out this distance, but I usually just sorta wing it (see picture below). 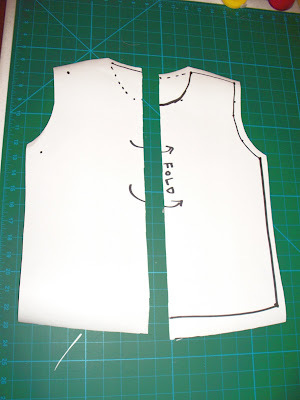 Important: cut the neckline according to the highest neckline (the back piece). 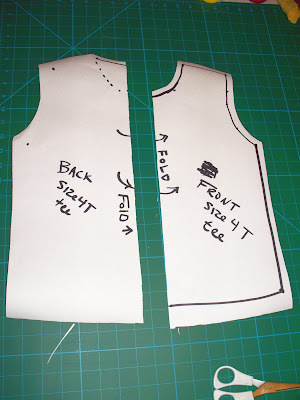 Allocate one pattern piece to be the front and the other the back. 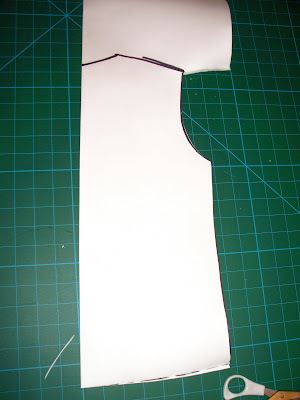 Cut the front piece according to the front neckline. That takes care of the front and back pieces. When you use your pattern, place the vertical center along a fold and cut around the bottom, sides, and top of the piece. To make life easier for you, I recommend taking a moment to label the pieces, write down the size, 'align with fold' marks, seam allowances, and any other information you'll find helpful in the future. 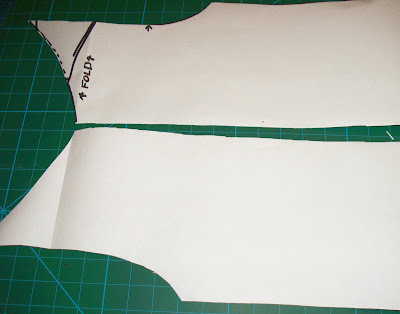 Take one of your bodice pattern pieces and lay it down on a sheet of paper so that the top seam (but not the seam allowance) is aligned with the top edge of the paper. 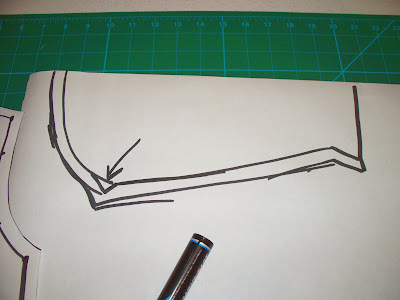 Trace the curve of the armhole onto the paper. The arrow in the picture indicates where I've draw in a little slanted triangle at the armpit where experience has taught me that without that little angle, the fit is awkward and tight. Just put a little nooby thing in the same place on yours and then trace around for the seam allowance. Cut out your sleeve and label it. 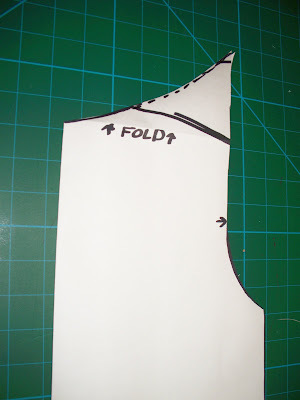 When using your sleeve pattern piece, lay the top edge along a fold and cut around the rest. This will open up into one sleeve. That is one complete pattern for a tee shirt. If you get the impression that it is a little loosey goosey and slap-dash, you are right. It lacks finesse, I admit. But, again, it will create a very functional tee, and it is fast and fun. I say, keep the meticious sewing for special occasions (or when you have a hankerin') and enjoy yourself with fabrics and embellishments. This basic tee can be altered in a hundred ways, and embellished in thousands. Try different techniques for heming (lettuce edging, ribbing, using bias tape, rolled hem, etc.) Add a hood or pockets. Embellish with ribbons and appliques. 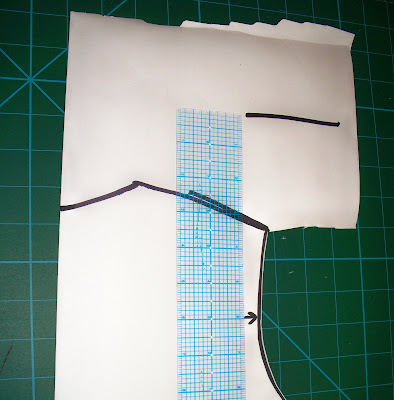 The paper on the left is the fresh paper with the regular tee pattern traced onto it. It has been folded in half along the vertical center so that there will be two half bodice pieces when we are done, the same as the above directions. Cut the pattern out along the bottom and side. Leave the shoulder area intact. Figure out how far over you want the overlap of the lap tee to go down the armhole. Mark this point and measure it. 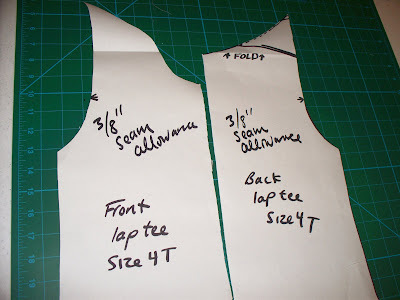 Measuring straight up from the shoulder, mark the same distance above the shoulder seam. 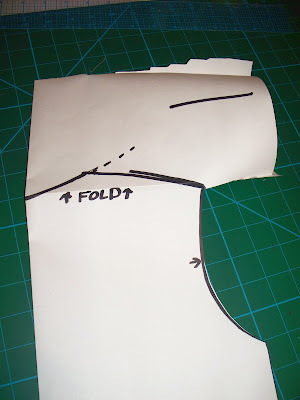 Fold the paper from the point of the shoulder seam where it meets the arm across to the vertical center at a 90 degree angle. 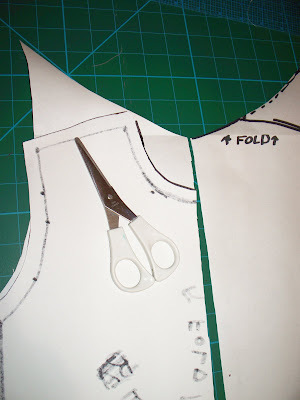 With the paper folded, cut out the armhole. 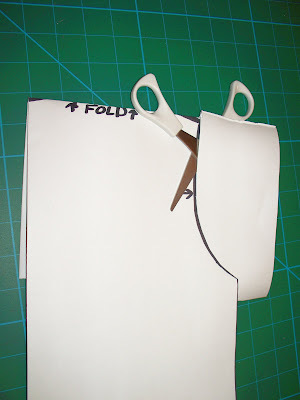 Unfold the vertical center fold and cut the bodice in half. You have two back pieces at this point and want to turn one of them into a front piece. 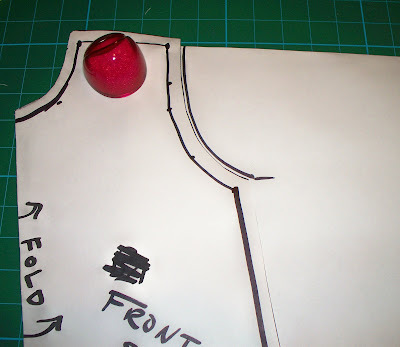 Use the front piece of your regular tee pattern to mark the front neckline. As always, I welcome questions and comments. I recognize that wee monkey! I found this via Elemental Stiches blog. 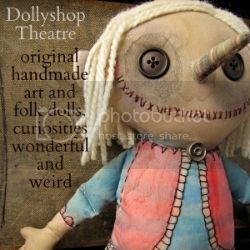 Thanks again for an awesome tutorial, I haven't looked to the kid boards at Craftster in months, so it's nice to see you here. Anyway...Looking forward to utilizing your tutorials once my sewing area is set up, again. I LOVE your tutorials...definitely going to be trying some of these!!! 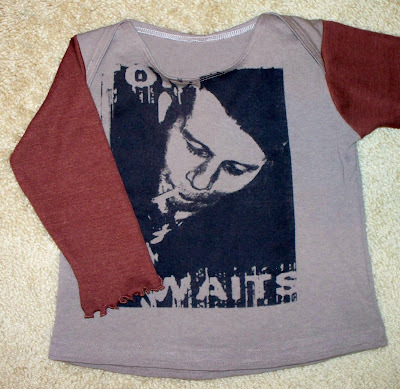 Every small person needs a Tom Waits t-shirt. Come to think of it, so does every big person. Aggie, there are a few ways to finish a knit neckline. The curling is caused by stretching during stitching. 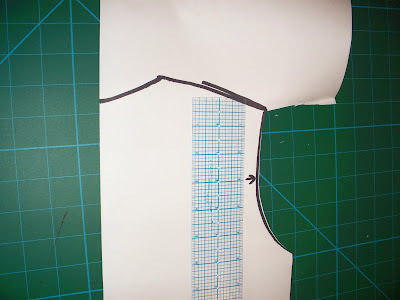 If you are using a bias tape made from the same fabric (I think that is what you mean, but I may be wrong), it does have to be cut on the bias for it to follow the shape of the neckline. I've really had limited success with this, so I may not be the best person to ask. There are other ways though. I like using ribbing. Or if just a regular hem, most of the time I use a stabilizer, such as tissue paper or used dryer sheets, both which rip off well when you are finished. Place the stabilizer between the feed dogs and your material and stitch normally. Using a double needle is good too, and looks professional. You can also use a 'walking foot', which has grippers on it to help move the fabric evenly through. And when pressing your neckline afterwards, use the steam from your iron and just hover over the fabric. Pressing it directly (particularly if you rub the iron back and forth) will really pull the whole thing out of shape, but steaming the stitches tightens them and the fabric. I hope that helps (and that was your question). Thanks for this one! 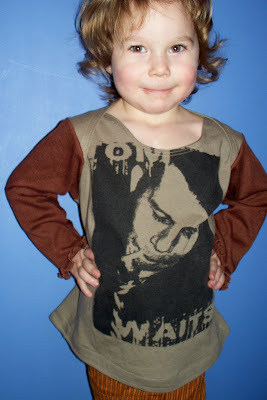 I made my little boy a new shirt today off an old one of mine's and he loves it :) Would show you pics if I could? Anyway, thanks for all the tutes, I hope to try out more soon. Do you know how much I could have used this tute 5½ years ago when I couldn't convince my then 6 month old (now 6 years) to allow me to pull a regular tee over her head? At any rate, I ended up taking apart, tracing, and then putting back together one of her onesies that fit well (which still left me having to wing it every time she grew a bit...lol...Thank you for this. I just found you... I love this turorial - I am going to have to try it. 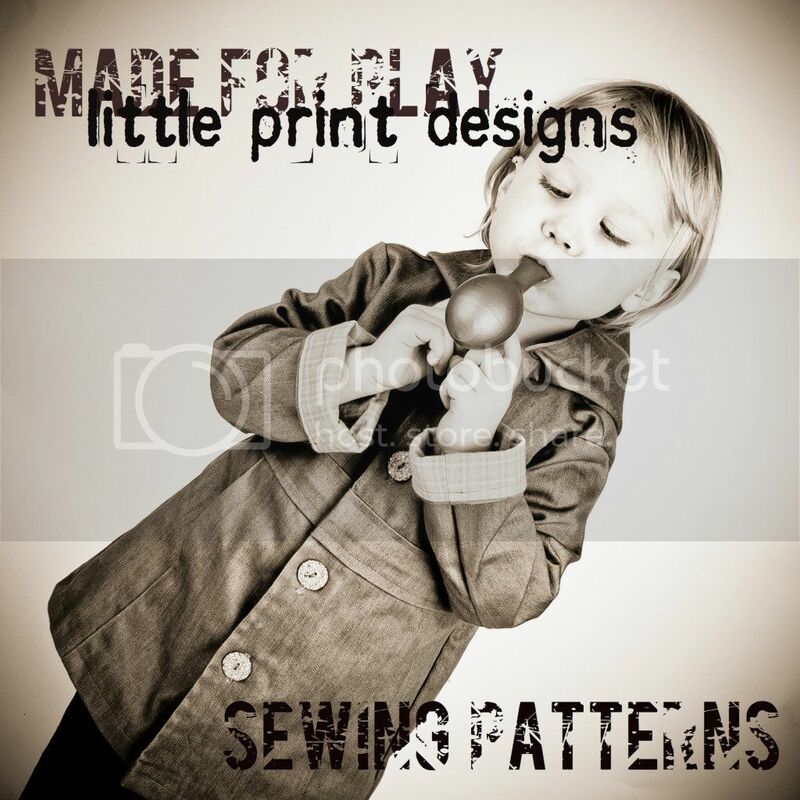 Just found your blog via whip up- some great tutorials and patterns! 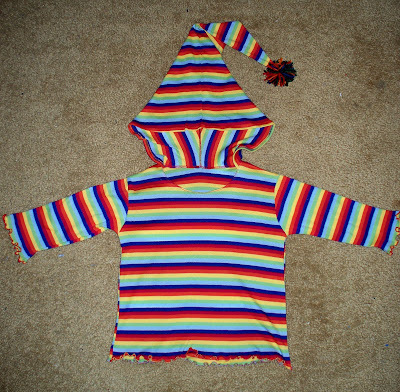 I have been pondering the problem of making toddler clothes that fit lately, and this is great- sensible and some good tips. Thanks for sharing! Love this instruction! Thanks for sharing! I'd love to like to my blog, if that's okay with you! and I've linked to your tute. 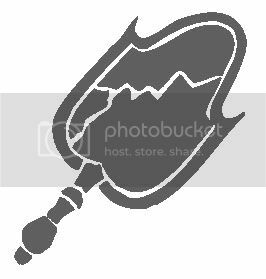 Could you possibly make this a download-able pattern? Crystal, do you mean just a basic t-shirt pattern, ready to cut and sew? Help! Successfully made my shirt pattern thanks to your site, but can't figure out the proper way to assemble it (very new sewer)...tips? Can't wrap my brain around how to attach the sleeves. This is for my daughter's robot Halloween costume...the pants came out great...but now I'm stuck! Maybe a question: In which way do you sew/assemble? 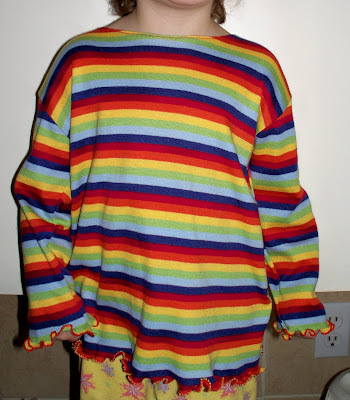 Can I assemble the front and the back, pin and sew them, and finish with the sleeves? Or do I have to sew front, back and sleeves at one and the same time?